Wouldn't you love to be a little kid again? In a cute cotton dress & flip flops & pig tails. 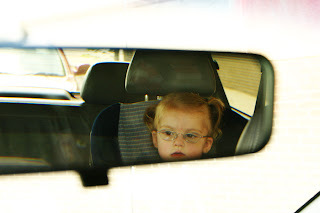 This is Sadie dancing & jumping & watching her reflection on the van as we head to the grocery store. See that orangy light cast on the driveway? That means it's muggy. Hot & sticky. REALLY wish I could get away w/ a cute little cotton dress. It'd sure feel a lot cooler. amen! 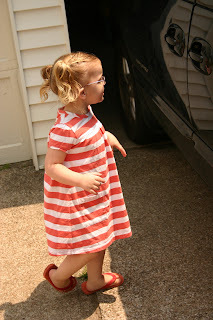 i always wish i could get away dressing in some of the cute outfits my girls wear-especially church dresses! sorry about that orange mugginess! She's wearing her glasses! She looks so cute. I know! I love her glasses. And hot , sticky & muggy is the worst. I'm sorry. she is so cute...I think we have the same car seat....Cosco?